Mini purists, just recently able to set down their small farm-issue pitchforks over the Clubman, should probably pick them right back up and head down to TSC to pick up some of those big ol' industrial-sized pitchforks they issue for CAFOs. That's because the third member of the Mini family's been spotted sneaking around in some Clubman skin, which it obviously killed on some backwoods trail because it couldn't keep up. That's right, we're told the picture above is a prototype test mule for the 2011 Mini Crossman — the off-road edition of the Mini nameplate. The newest member to the badge is expected to get all-wheel-drive. You know, to appeal to that all important "I'm not driving a Mini because I'd look...yeah" male demographic. The new Mini Crossman's expected to be built by Austrian manufacturer Magna Steyr and scheduled to hit the trails during calendar year 2010. 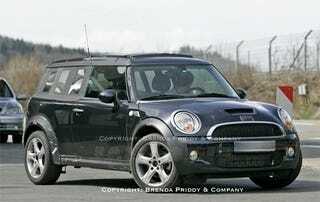 Full spy report from Brenda Priddy after the jump and a full-sized picture of the 2011 Mini Crossman here. Mini enthusiasts have a whole new reason to get excited, now that the name of the company's upcoming crossover has been released: The Mini Crossman. The Crossman was previously referred to internally as the "Colorado" (but obviously that name is already taken) and will bring the Mini brand firmly into new territory. The Crossman is expected to ride higher than current Mini models, and have All Wheel Drive, making it a new option for weekend off-roaders. With these new capabilities, Mini plans to expand their customer base to include those young men who want something a little more "masculine" than the current Mini offerings. The Crossman will be the first Mini to be assembled outside the U.K. Austrian manufacturer Magna Steyr will build the car for Mini - which is scheduled for release during the 2010 calendar year.